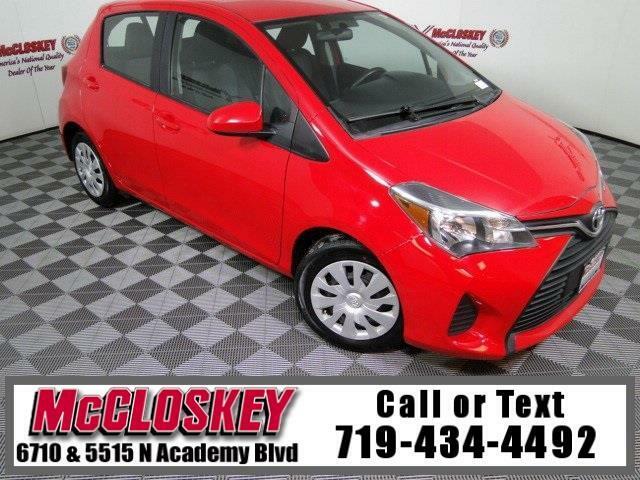 Easy to love and drive 2015 Toyota Yaris L with Sirius XM Radio, Entune System, Fuek-friendly 1.5L I4 Engine, Power Windows and Door Locks, and Much More! Standard features on the well-equipped L include 15-inch steel wheels, power door locks and windows, air-conditioning, a height-adjustable driver seat, a tilt-only steering wheel, a trip computer, a 60/40-split folding rear seat, Bluetooth phone and audio connectivity, and a six-speaker sound system with a 6.1-inch touchscreen, a CD player, HD radio, an auxiliary audio jack and a USB/iPod interface. The front-wheel-drive 2015 Toyota Yaris is powered by a 1.5-liter inline four-cylinder engine rated at an impressive 106 hp and 103 pound-feet of torque. This vehicle passed our 110 multi-point inspection and is backed by our National Quality Dealer of the Year Award. We are an ''A+'' Better Business Bureau Rated Business. We offer low interest rate financing, low down payments and the highest trade allowances in the state! Here at McCloskey we do things a bit differently, we shop our competition every day to ensure a great value to you. Come on down and experience it for yourself. This McCloskey Assured vehicle includes a 2 month/2000 mile Warranty and a Vehicle History Report!! At McCloskey we strive to provide ASSURANCE, TRUST, VALUE AND QUALITY! Call 719-434-4492. Message: Thought you might be interested in this 2015 Toyota Yaris.